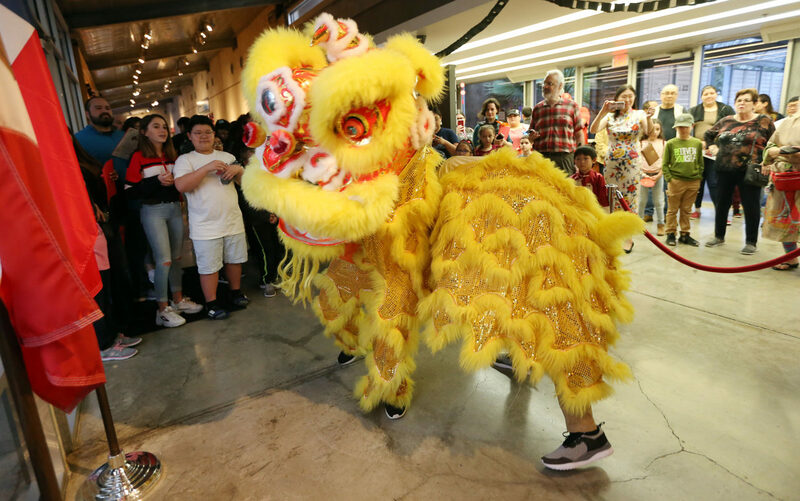 McALLEN — The hallway of the International Museum of Art & Science was embellished with Asian ornaments and detailed scrolls of scriptures on Saturday. Red lanterns and glittering fish were taped to the walls, and paper national flags hung in front of exhibits, showing attendees what country they were about to step into — the Science on a Sphere room hosted Korean music and origami lessons, Taiwanese calligraphy was held in the art studio and China took over the Discovery Pavilion, featuring fan painting and traditional Chinese games for children. 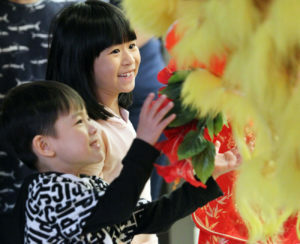 Here, locals of all ages and nationalities were celebrating the seventh annual Lunar New Year Festival at the IMAS, a national holiday of many Asian countries. Xin Zhang, a Chinese professor at the University of Texas Rio Grande Valley, reminisced about how her hometown, Qingdao, China, commemorated the holiday. New Year festivities begin with the first new moon of the lunar calendar and end on the first full moon, which happens 15 days after. For 2019, the Lunar New Year starts on Feb. 5. Zhang was the coordinator of the traditional Chinese lion dance that took place in the hallway of the museum. Two performers controlled the movements of a shimmering golden lion, with orange flames around its nose and head. The lion’s features flared as dancers moved to the beat of clashing symbols. The lion symbolizes strength and bravery, and the dance is performed to bring prosperity and good luck to the upcoming year. UTRGV Korean language lecturer Mijin Oh-Villarreal manned a Korean musical instrument booth with two of her students. There, guests were able to test out the four samulnori instruments, each of which represent an element of nature: jing which symbolizes wind, kkwaenggwari, which represents thunder, buk, which represents clouds and janggu, rain. After the lion dance, Oh-Villarreal and six of her students performed a Samulnori dance, which translates to “a four musical instrument play.” Samulnori folk music was traditionally performed in rice-farming villages in Korea to assure good harvests, and is now a dance of fortune and joy. Oh-Villarreal said she enjoys playing traditional Korean music for her students and is glad that this time, they will be performing with her. Attendees had the opportunity to have their name translated to Korean, Taiwanese and Chinese characters, and paint Korean “tal” masks, which symbolize freedom. Cassandra Ponce, a junior at UTRGV who is taking Oh-Villarreal’s Beginning Korean course said said that though she is only a few weeks into the semester, she understands the importance of availing yourself to learning about other cultures.